China’s government is likely the one behind the significant increase in gold imports that has made the country become the world's second-largest consumer of the precious metal after India, reports Financial Times (subs. required). Demand for the yellow metal in China has experimented a solid growth over the past four years to the point analysts predict the nation’s gold demand will beat supply by 2015, making it the world’s largest buyer by year-end. China is already the world's biggest gold producer and it has been so since 2007, with an annul output of 403 tons in 2012, a year-on-year growth of almost 12%. The question is, says Evy Hambro —chief investment officer of BlackRock’s natural resources equity team, where all that gold is going. “Is it going on to wrists, ears and necks or is it going into state reserves?,” he was quoted as saying in the interview with FT. 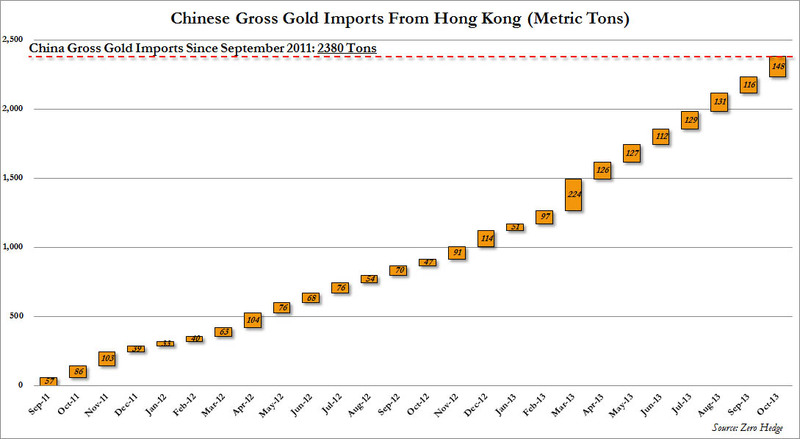 The Chinese government’s does not publish any gold trade data. 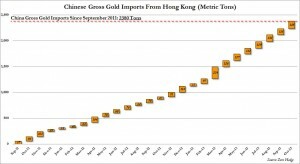 The numbers from Hong Kong, a major conduit for gold into the mainland, are used to obtain a realistic estimation of the country's trade in the precious metal. And those figures aren’t minor. Imports from Hong Kong climbed to the second-highest level on record in October, as the country bought more than 100 tonnes of gold for a sixth straight month. For the first ten months of the year, imports totalled about 986 tonnes, more than double from a year-ago period. 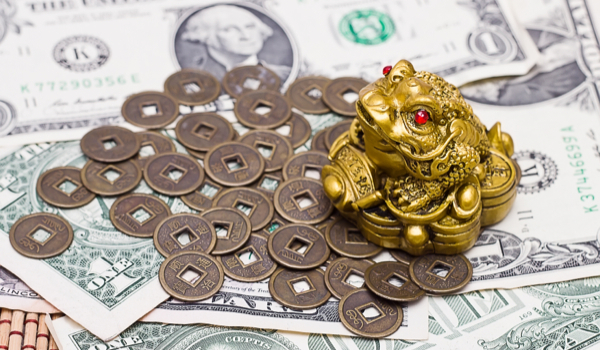 The last official figure on record, provided by the People’s Bank of China in 2009, show the country’s bullion reserves standing at 1,054 tonnes. But based on global trade data, some analysts suspects China’s central bank has bought up to 300 tonnes of gold this year. Backing is really what the gold market seems to need. This year, the shiny yellow metal dropped 25% and is steadily heading for the first annual drop since 2000. Quite a few investors lost faith in gold as a store of value amid a rally in U.S. equities to a record and muted inflation. Meanwhile, China has been easing rules this year regarding gold trade and investment. Other than ETF approvals, it has extended trading hours on its bullion exchange and introduced a draft plan to allow more banks to import the precious metal.